I have written travelogues for all the trips that I have ever taken since I started this blog. For some reason, the Ooty trip of last year got missed out. Being a stickler for finishing projects, this has been in my to-do list for a while. What better time than now to reflect about this trip! It all started with a casual conversation with my dad when he was visiting me in May last year. He casually mentioned that it's been 19 years since he had visited Ooty. When I was a kid, my dad used to frequently take us to Ooty during summer holidays. I might have done atleast 5 trips with him earlier. So I started planning the trip with my husband, booked a hotel and packed. The night before our trip, I had a spark to check if I could book the tickets for the Ooty heritage train in advance. I quickly looked up IRCTC and was pleasantly surprised that you can reserve tickets for the "kutti" train. 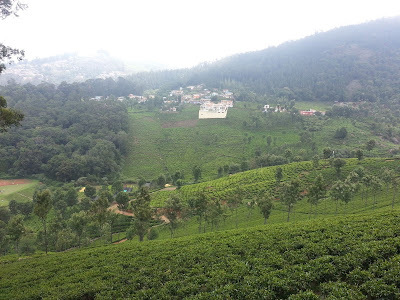 I booked a trip from Ooty to Coonoor and was very excited about the train journey more than anything else. We started off at around 5:30 AM and drove towards Mysore with a breakfast stop in between. The route passing through Bandipur was pleasant and smooth. We spotted some elephants, monkeys and deers. D was excited initially but soon she fell asleep. After reaching Theppakkaadu, we took a left turn and the steep hairpin bends started after some time. You could feel the weather change as you climb up, though it wasn't very cold as I remembered the Ooty of 80s and 90s. We reached our hotel "I-India" around 1:30 PM. The views were amazing from this place and we could clearly see the valley and the cloud cover. As we were quite hungry, we headed straight to lunch and it was a decent spread. Everyone else were so tired that they were having a deep afternoon nap while I was wide awake. So I took a walk by myself around the locality, with the weather changing from warm to pleasant to cold, in a matter of 2 hours. After a cup of tea, we drove to the town and roamed around a bit. We spotted Nahar hotels, had some snacks and took a walk. The Charring Cross area was very crowded, given that we were visiting in the busy peak season. We left early the next day, went for the usual touristy spots - Ooty Lake, Botanical Gardens and Doddabetta peak. D was excited to take the train and the boat ride at the Ooty lake, ran around for a little bit at the Botanical Gardens but then she became so tired that we had to carry her all along. We couldn't roam around much carrying a toddler. After a late lunch at Nahar, we came back to our hotel, relaxed a bit and then took a short drive to take a peek at Lawrence School. The next morning, we were all excited for the toy train journey. When we came to the railway station, there was a long queue waiting at the ticket counter. I was so happy that I had booked the tickets in advance. Once the train journey started, it was so amazing - the breathtaking views, the cool breeze, the cluster of mountains, tea plantations and the little railway stations enroute. D also enjoyed but was very sleepy as we woke her up early in the morning. After reaching Coonoor, we booked a cab and went to Sims Park. As soon as D noticed a play area inside Sims Park, she was in no mood to leave. There wasn't much of a crowd, she had the place to herself and was super-thrilled. The cab driver took us to a tea factory where we noticed the different stages the tea leaves go through before packaging. The aroma of fresh tea was refreshing and we also got a taste of chocolate tea, ginger tea, masala tea etc in a little tea shop. Bought some packs for home as well. The cab driver dropped us near Coonoor bus stand around 12:45 pm. We had to wait for more than an hour to get a bus to Ooty. It was so hot, there wasn't any shelter where we could wait and our little girl was also getting restless. Finally, a bus came and everyone rushed to catch a seat. Thanks to my dad, we got a seat and settled in the crowded bus. Thankfully, D didn't cry as she was too tired. She just hugged me and fell asleep. We had a good thali lunch at Nahar, shopped for some time and retired for the day. It was time to leave the next morning. We decided to take the longer route through Mudumalai and Gudalur. On the way, we stopped at a pine forest which looked like a tourist spot and there were a few activities like horse riding. D and her dad took the ride and they went around the forest for nearly 30 min. D enjoyed the horse ride so much that she made a big fuss to get down from the horse. We also stopped at Pykara falls and went for a walk but the water flow was very little. It was a tiring walk up and down but the views made it worth the effort. We grabbed some fresh carrots and beetroots from a roadside vendor. 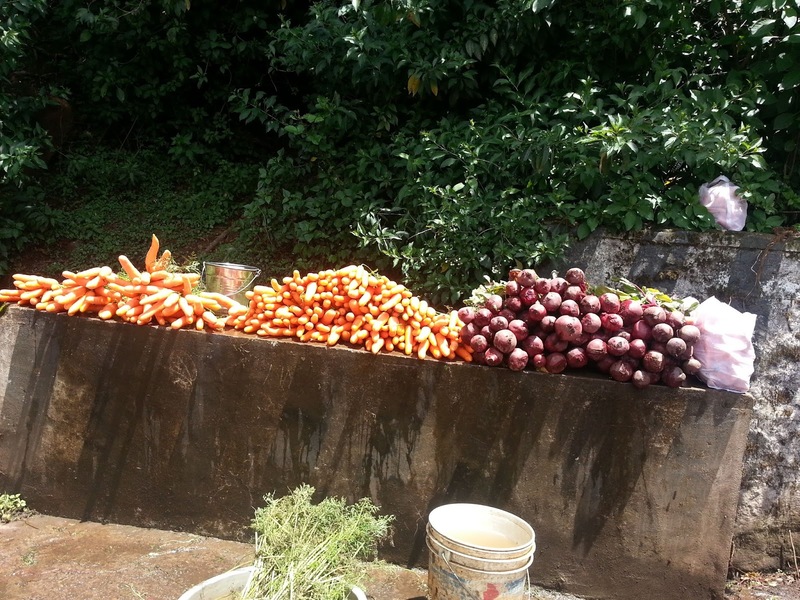 Couldn't have asked for a better souvenir from the hills than these fresh colorful veggies. I wouldn't recommend I-India for the stay. It's extremely overpriced (2500 per night) for a very basic, small room. What they call as complimentary continental breakfast is just bread toast and bread omlette. It has a good view of the valley and slightly away from the crowded market area. But it's not worth it.